Herald: What’s inside The Lunchbox? Team Café: Congratulations on the BAFTA nominations. Your reactions? 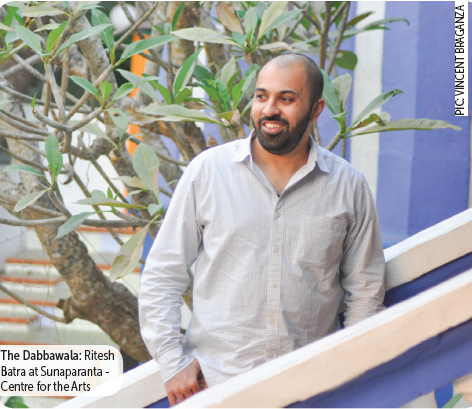 Ritesh Batra: It’s an incredible honour. I actually heard the news when I was in London last week and I was pleasantly surprised. To be on that list, it is pretty amazing for me; I still can’t believe it. I’m just happy to be nominated and excited to go and meet all these people next month. TC: In its production stages, ‘The Lunchbox’ was an indie movie but when the producers started pouring in, suddenly it became a studio film. What was the transition like? RB: As a filmmaker, you can make a film but you also want to be seen by people. Otherwise it is pointless. I have a baby girl who was born just five days after ‘The Lunchbox’ shoot. Of course, I have to provide for her and the family but it’s not just about that. It was about telling an Indian story to the world. I had stayed away from India for 12 long years during which India had changed. I wasn’t sure if it would be watched or received well in India. When we premiered in Cannes , the greatest distributors from around the world picked up the movie and it sold literally in every market in the world. And then we started thinking about how to get this movie to India. That’s when Karan (Johar) and UTV came on board. It was a real blessing because it meant that a lot of people in India were going to see the movie as well. In India, we have about 7,000 movie screens while in the US they have about 45,000 and one-fourth of our population. In China there are 19,000 and growing very fast. So in India, we aren’t adding movie screens fast enough. It is not like people do not want to watch these movies; people do not have anywhere to go. So it becomes really important to have the right of partners on board – to get the film in theatres and get the movie seen. If it is not in theatres, it is not going to be on TV either because box office dictates everything. TC: With multiple producers onboard, did you still manage to make the movie the way you wanted to? How much of creative freedom did you have? RB: I had complete creative freedom. I had what they call the ‘Final Cut’. All the producers from around the world helped the movie to be distributed and seen, which is, in many ways, as important as making a movie. TC: ‘The Lunchbox’ was your baby right from the beginning. But post its success, it appeared that a lot of people who were involved even in smaller capacities were taking credit for its success. Do you agree? RB: I feel like everybody who was involved in the film in a big or small way is a part of it. I’m happy that the success of the movie rubs off on everyone who was involved in it. It makes me very happy. That being said, this business is a marathon, it is not a sprint. It has done wonders for my career; it has done wonders for Nimrat (Kaur) as well. Irffan (Khan), of course, without him, I don’t think the movie would have had the reach or the quality that we have been able to achieve. So I have a very philosophical way of looking at it. I have no problem if people benefit from the movie and take credit for it. TC: Are you satisfied with what this film has fetched you, especially since a lot of people have been riding on its success? RB: Absolutely. The movie is travelling, it is still being seen. We just got a BAFTA nomination. I got this award for Best First Film from the Toronto Film Critics Association. We beat out a lot of good movies like ‘Night Crawler’ that came out last year. And then there’s a lot of interesting work that is coming my way. I don’t think it could have gone in a better way. TC: What are the learning points for you from ‘The Lunchbox’? RB: When we were working with the actors and when we were editing, it was all about being honest. We took five months to edit it and 3-4 months to do the sound design. There were all kinds of pressure but I didn’t let anything affect the quality of the film given the resources that we had. Now it is just about doing it over and over again. Writing a movie and making a movie doesn’t get easier just because you’ve had success. I’ve learnt specifics about writing a movie, about dealing with people and situations. In context of BAFTA and the whole Oscar controversy that happened, my expectation was that we will have help from the Indian government film bodies, NFDC and industry film bodies to take it even further. Now that I have the last year or two behind me, my thinking has changed. Now I think, ‘why should we expect help from anyone?’ A film has its own destiny. It cannot be affected by anything. It was wrong on my part to expect things because you can do your job, you cannot expect everyone else to do their job. It is an unfair expectation to have. RB: Well, I’m working on a book adaptation of a novel that I love. But I’m not at liberty to talk about it. I’m also writing an original story that is set in Mumbai. It is called ‘Photograph’. I would like to work with the same star cast of ‘The Lunchbox’ in it.